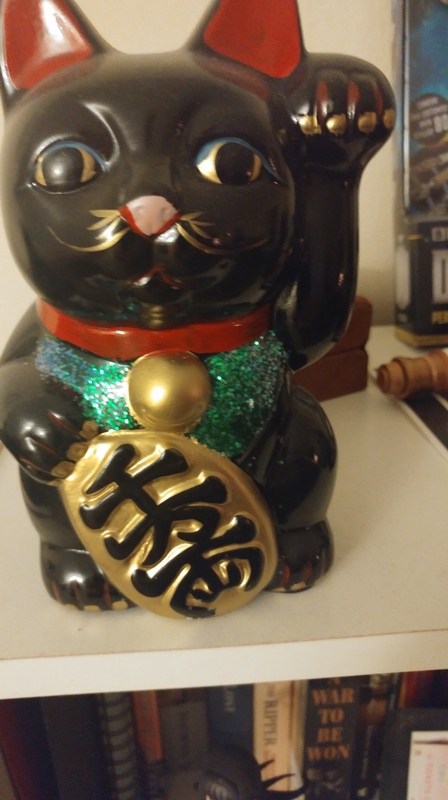 Back in December, I posted about how I was collecting dolls, figurines, and statuettes. Since then, I’ve collected quite a few more for my collection, so I thought I’d write another post about the collection and show off my new acquisitions (as well as have another go at giving my parents more grey hairs and making them wonder where they got such an unusual son. What can I say? I am a nasty little devil). 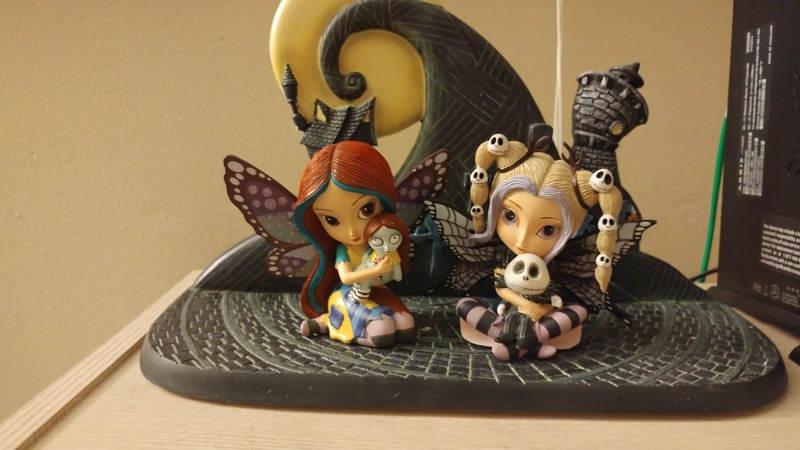 So apparently the line comes with its own little Halloweentown display. 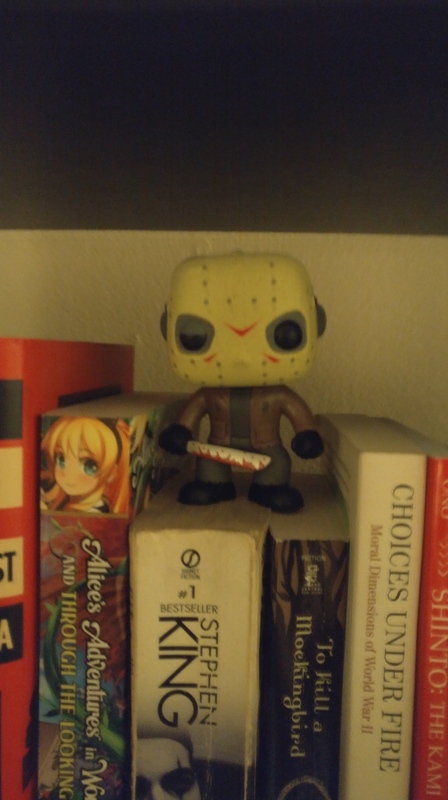 I got that not too long after the last doll/figurine-related post. After that, they sent me Oogie Boogie’s character. And then Zero the ghost dog. And I thought that was it, but then they sent me Lock, the kid in the devil costume. And then they sent me Shock, the witch girl. And that’s where we are so far. I’m assuming Barrel, who I think is some sort of skeleton kid, is on the way at some point. 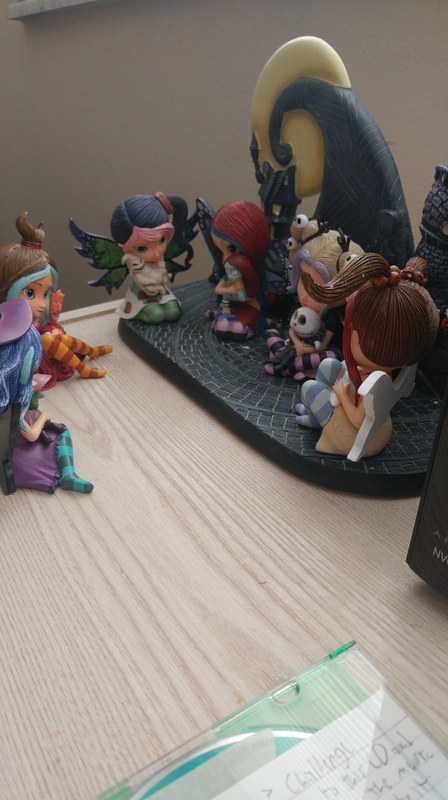 I’m not really sure how many characters are in this collection, but I’m happy to keep paying for them and seat them in a circle in my apartment. 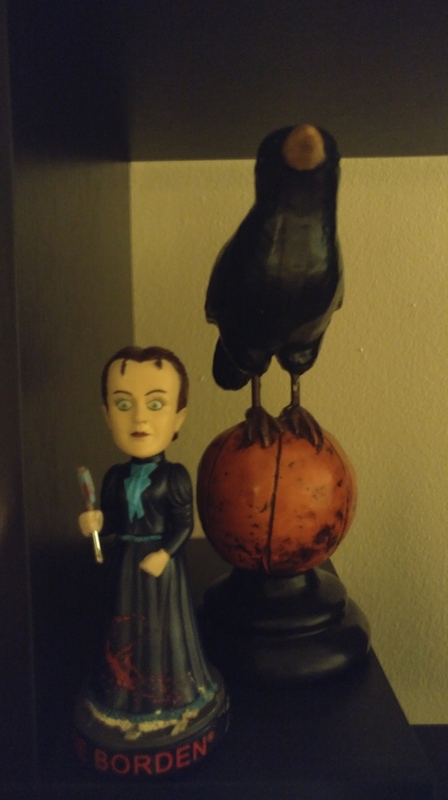 Also, I recently bought another, very special figurine from The Hamilton Collection, the company that makes those little statues. This is the Guardian of the Underworld. Yeah, pretty scary. 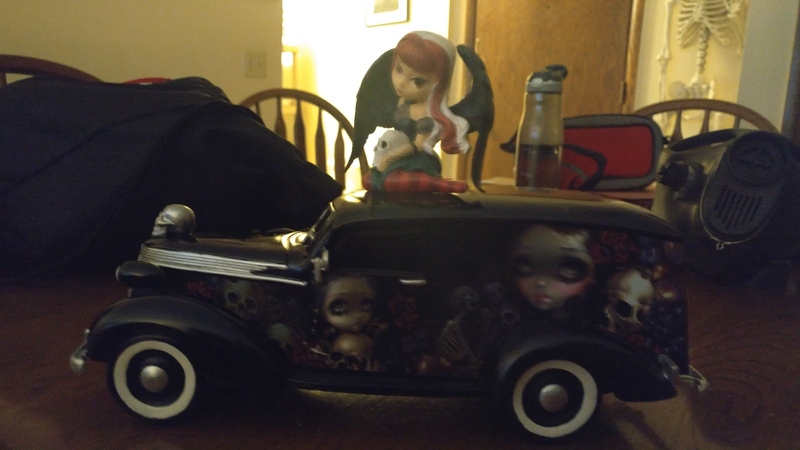 And I’m pretty sure that’s an old Rolls Royce hearse she’s sitting on. I wanted to bring that into work, but my supervisor put the kibosh on that one. Too bad, it would’ve been such a great talking point for anyone who came to visit my office. Then again, given what we do in my office, it might put people off and give them the wrong idea. 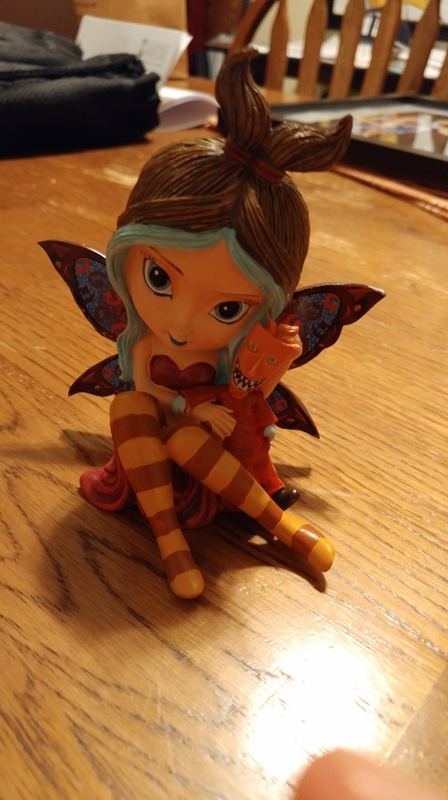 Of course, not all my new additions have been from The Hamilton Collection or look like pixies from Hell. 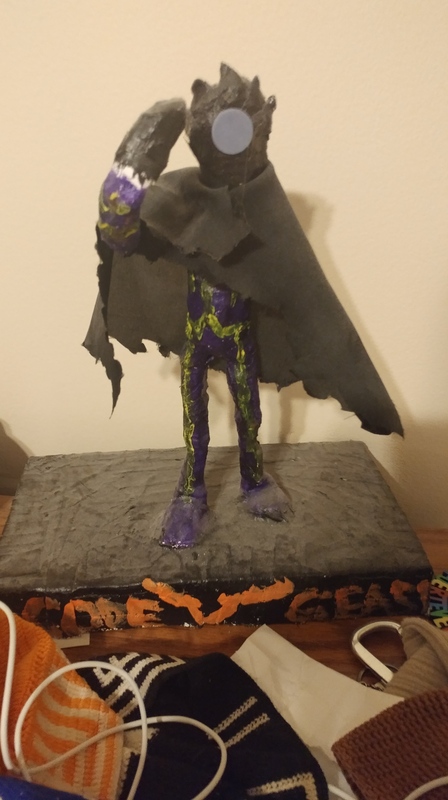 Remember in my last post I mentioned that my very first figurine was one I made of the character of Zero from the anime Code Geass? 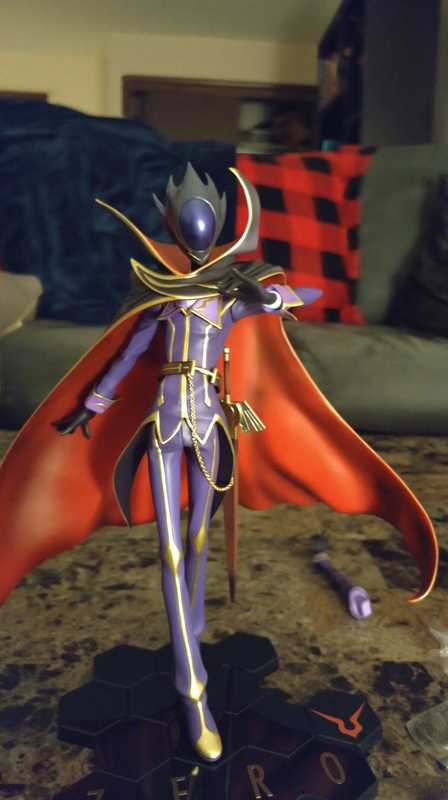 Well, I finally got a real Code Geass Zero figurine! This was one of my most anticipated acquisitions when I bought it. And it’s so cool! You can change heads and arms depending on whom you want to wear the costume (spoiler alert: different characters in the anime wear that costume at different points), and take on and off the sword around his waist. 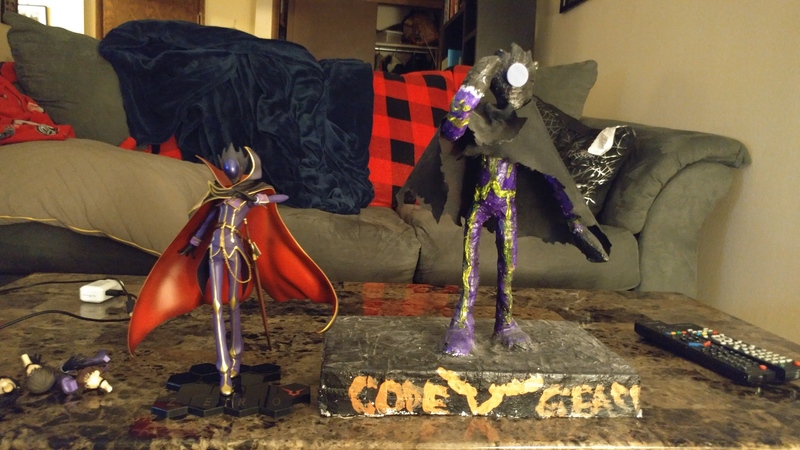 But I’m telling you, lining the real figurine next to the one I made all those years ago was a big moment for me. 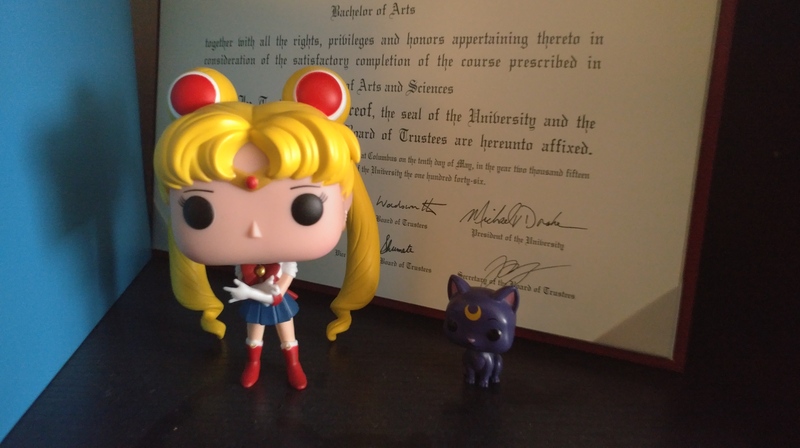 It felt like I was showing myself how far I’ve come in life that I can actually collect these things for myself, and I don’t just have to make them. I’ve also made a few acquisitions that coincide with another love of mine, ballet. 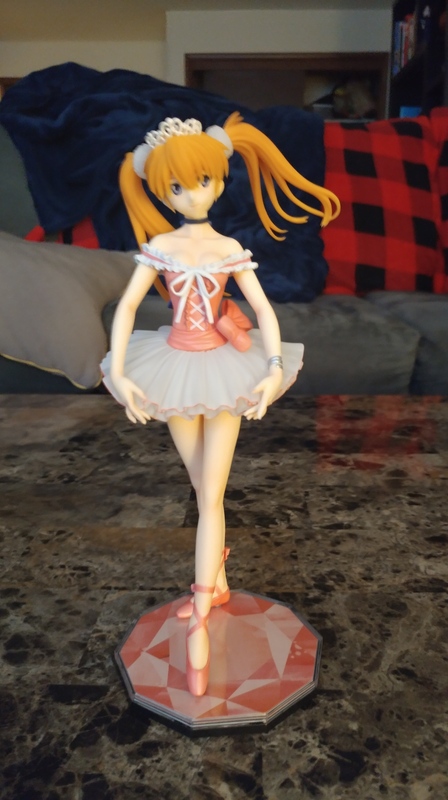 The first acquisition of this type is a figure of Asuka Langley Soryu from the anime Neon Genesis Evangelion (I already have two figurines of her, as she’s my favorite character, but this one is probably my favorite), dressed up as a ballerina. 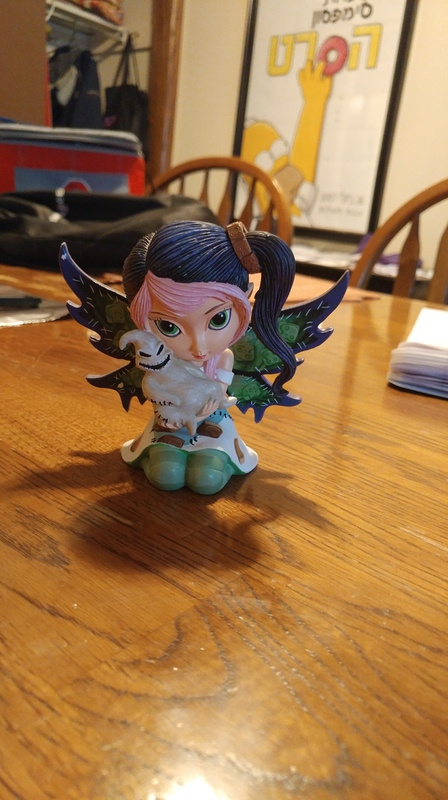 I absolutely adore this figurine. It looks like she’s about to break out into dance, which would be very cool if it could happen. 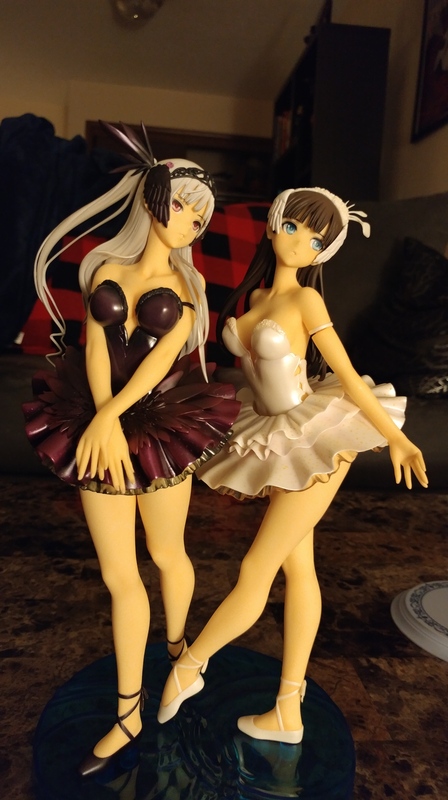 I also got two figurines based on Odette and Odile from Swan Lake. I was really psyched to get these, especially since I saw that ballet last November. 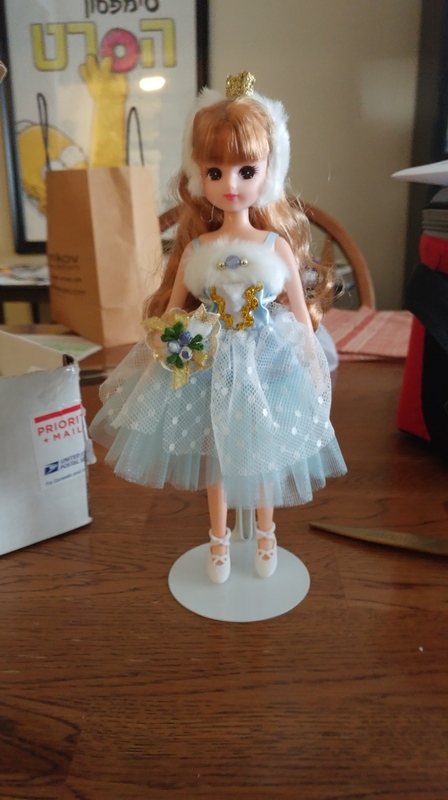 These figurines comes with their own individual stands, as well as a shared one for a pas de deux (not something that ever happened in the actual ballet, but whatever). They look so graceful and their eyes are so expressive, I just love it. They’re so wonderful, they gave me an idea for a novella a while back that I’d like to write at some point. 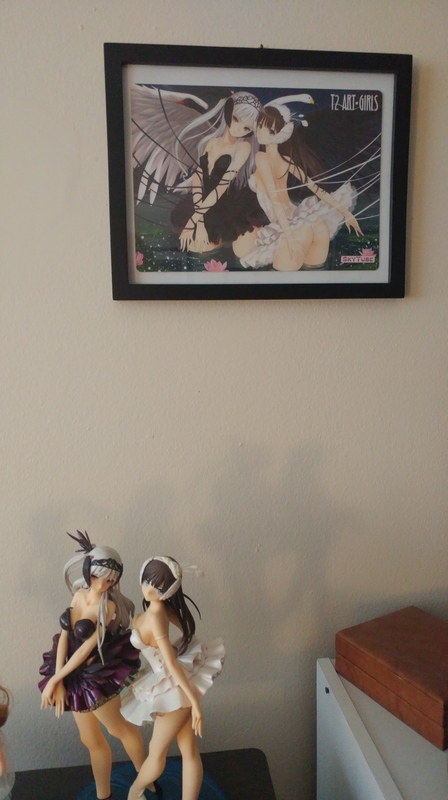 They also came with a lithograph of an illustration that I believe inspired these figurines (I think that’s what the figurines are based on), which I hung up not too long ago after finding a picture frame that was the right size, right by where I keep the actual figurines. 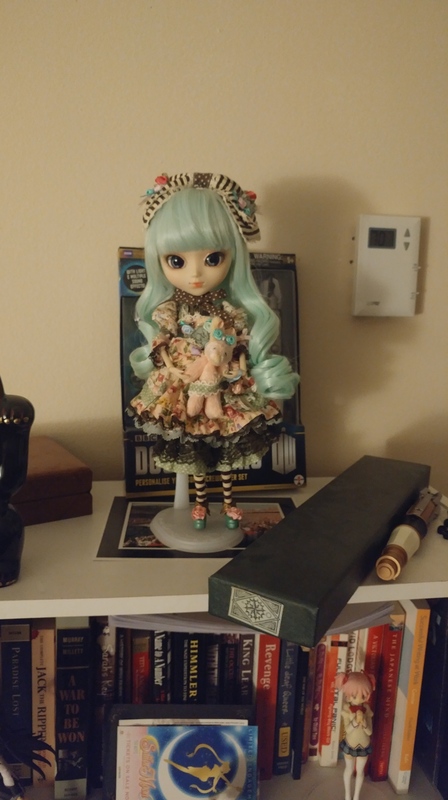 My third ballet-related acquisition is a proper doll, a Liccca-chan doll. Licca-chan is like the Japanese equivalent of Barbie, and this one was so up my alley, that I couldn’t help but order it. The arms aren’t as movable as I thought they’d be (so no fifth position posing), but I still like it and I’m glad I bought it. Of course, not all of my collection is so pretty. You guys know I’m a Lovecraft fan, right? 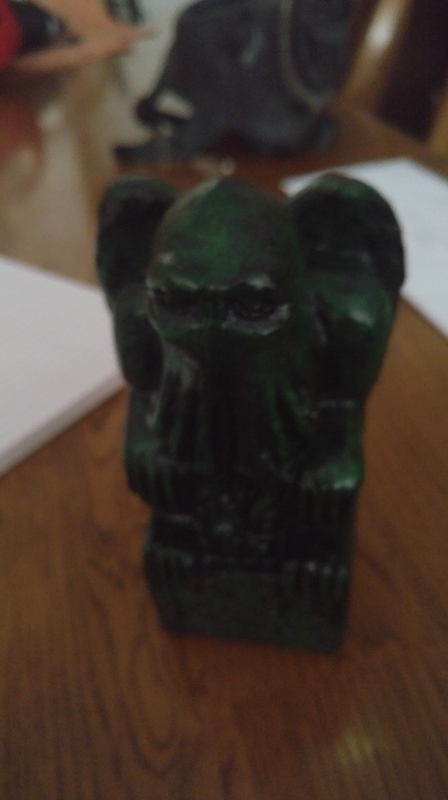 Well, I recently acquired a Cthulhu statue from Chile. I’ve been wanting a statue of Cthulhu for quite some time now, so to finally get one was pretty awesome. I’m actually not really sure what this statue’s made of, to be honest: I bought it off Etsy, and it’s supposed to be made of some sort of clay, but at times it feels like wood, and other times like stone. Which, considering this is a statue of a powerful god in the Cthulhu Mythos, does not surprise me in the slightest. My supervisor may let me keep this one in the office, which I would find cool, but others might freak over. Of course, that’s the intended effect, so let’s hope he says yes. 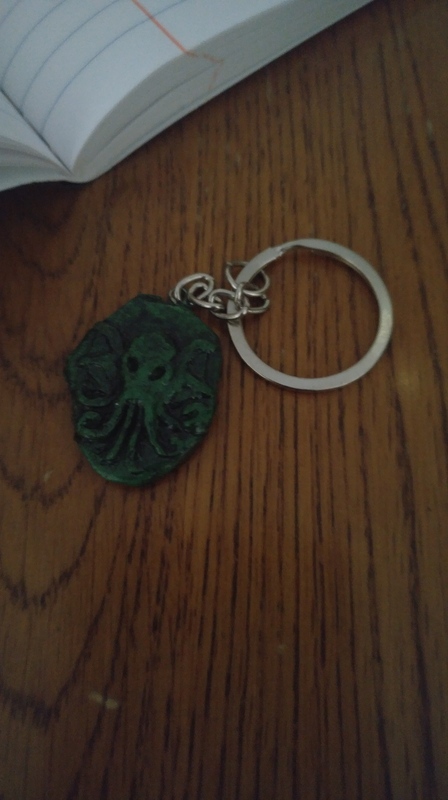 Also, the store I bought it from included a free Cthulhu keychain because he’d been on a hike when I made the order and didn’t get it until when he came back a week later. I told him that wasn’t necessary, but he included it anyway. Such a nice guy, and I love the craftsmanship. Also, I’m not sure what this is made of either. Fuh-reaky! And finally, we get to my last and possibly my favorite acquisition, as well as the one most likely to be haunted. 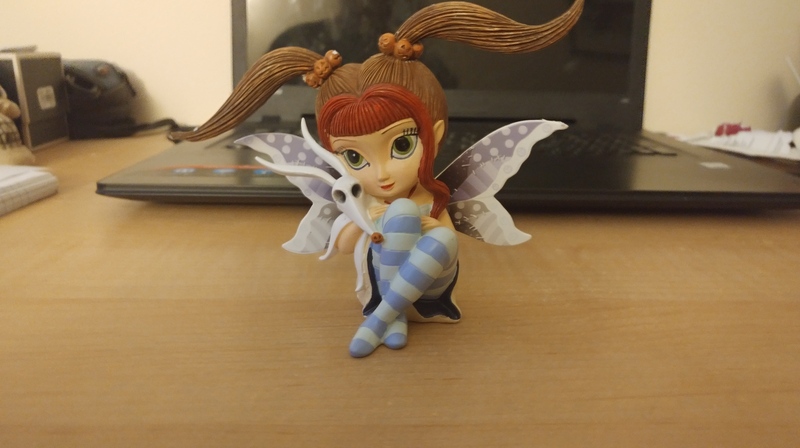 This is a Pullip doll, which is a brand of South Korean fashion dolls known their big heads and equally big eyes. 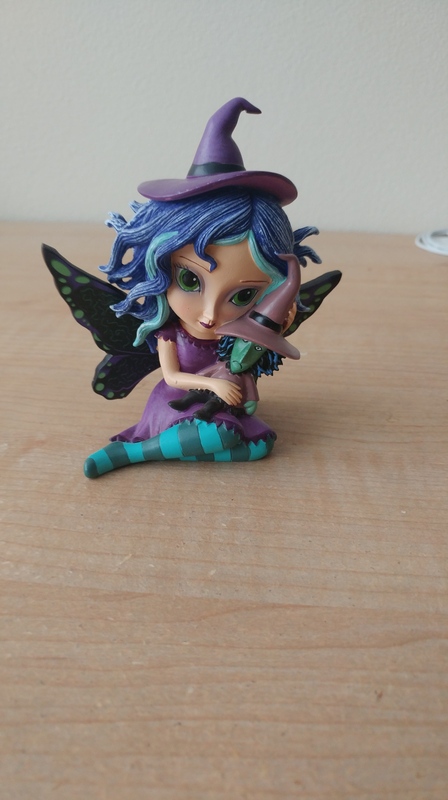 This particular one is from the Alice du Jardin series, so I call her Alice, and she is the “Mint” version. Sometimes I feel like she’s really watching me while I’m writing or watching movies on the couch, and that she’s trying to influence me. If she is, I think she’s trying to influence me in positive ways though. Easing my stress and that sort of thing. So that’s the latest on my collection. What did you think? 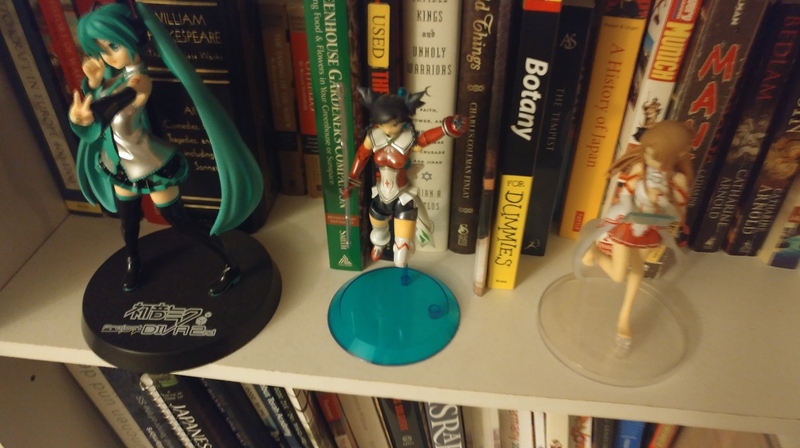 (Yes, I’m aware that some people find my collection very weird, but since when have I ever been interested in being “normal?”). I’m personally very proud of it, and hope to add to it over time. 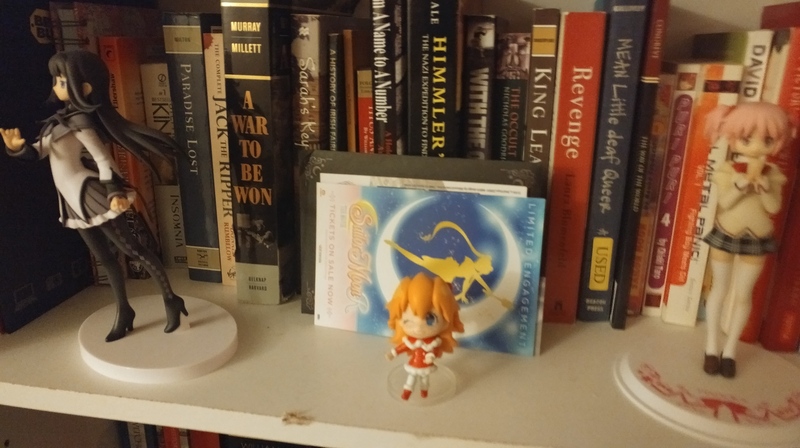 I’d especially enjoy getting the entire main cast of Sailor Moon in figurine form, though that’ll have to wait until I get some new cabinets (someone’s letting me have his when he moves out of town). In the meantime, I love what I got, and I don’t ever want to part with them. 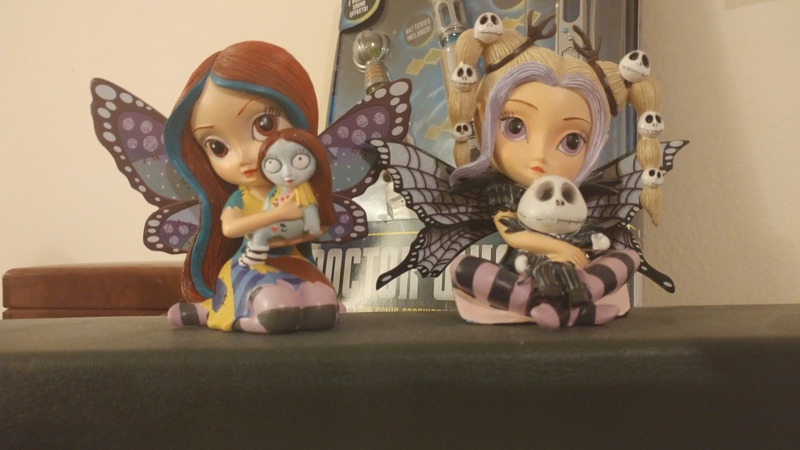 Do you collect dolls and figurines? 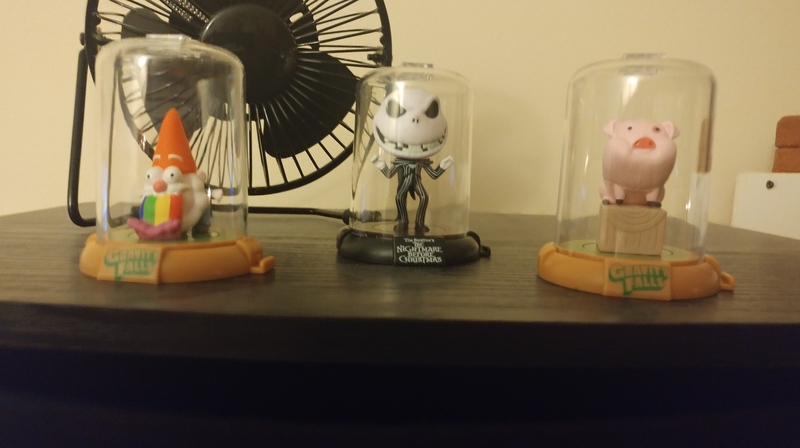 What are your thoughts/suggestions on collecting them? 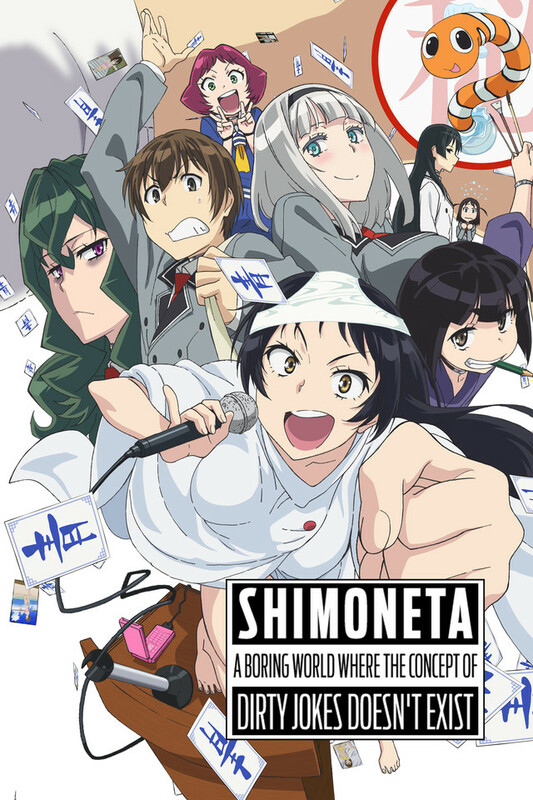 A couple of months back, I tried watching this anime I discovered on Hulu. 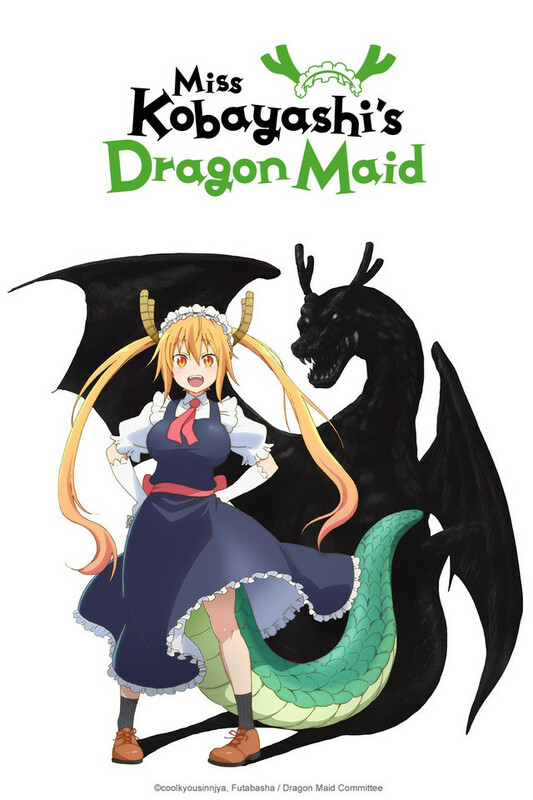 The idea for the series sounded interesting, it was a fantasy series with a big romance element, and it was loosely based on a popular fairy tale. 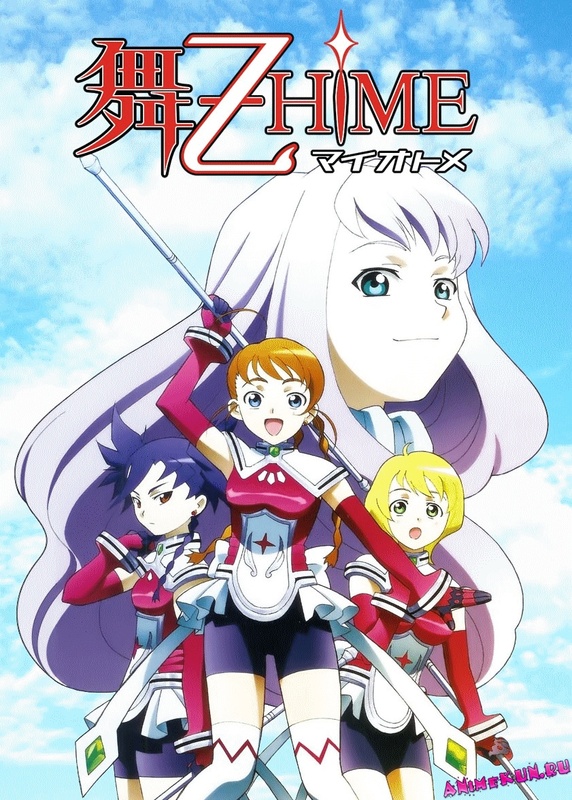 I decided to try it (I’d found anime and manga I loved on less than that), and settled down to watch a few episodes. It had a good first episode…but then the problems set in. One of the major ones was that after the first episode, when it’s pretty obvious that the two leads are attracted to each other, there’s nothing really to make the romance aspect exciting. They just settle into this rhythm that says, “Oh yeah, eventually they’ll get together.” Nothing that came up really served as a threat to their relationship, and because the story’s main focus was the romance aspect, I kind of lost interest. Thus this post. Every good fiction story has some sort of conflict, something for the protagonist(s) to overcome and aid them while they grow as people. These conflicts can be outer and/or inner conflicts. In Harry Potter, it’s Harry’s battle to stop Lord Voldemort and protect his friends. In Stephen King’s It, there’s a shapeshifting evil clown and the desire to hang onto childhood wonder while also accepting the inevitability of growing up. In When Marnie was There, it’s Anna accepting that she’s the one isolating herself, and that if she only comes out to people, they will accept her. In romance, it’s often the main couple realizing and struggling with their feelings for one another while something tries to keep them apart. Every good story has a good central conflict. 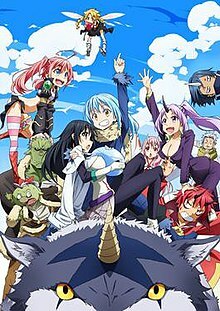 I’ve read a few romance-heavy novels (not many, but some), as well as watched a few TV shows and taken in several anime and manga with strong romance storylines. What always makes them good or memorable to me is the journey for these characters to fall in love with each other and get together, and all that can potentially tear them apart. 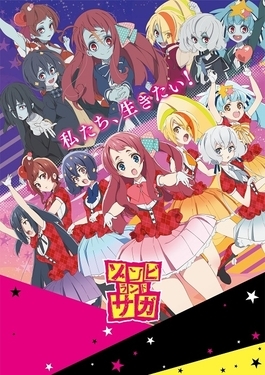 Without them, like in the anime mentioned above, the story quickly becomes boring. In The Mammoth Hunters by Jean Auel, the two main characters start out in a relationship, but they nearly lose it when a new suitor tries to sweep the female of the pair off her feet (the outer conflict), as well as the couple’s vastly different cultures/childhoods and their communication issues (the inner conflict). Part of what made that novel so exciting was watching those issues affect their relationship, feeling the mistrust, heartbreak, and anger this couple went through. It was thrilling, because you really felt for these characters and wanted to see them together in the end. And getting to that end and overcoming their issues in the process was what made the novel as a whole good. Arata the Legend: great example of how a story can have a compelling romance without that being the main subject of the story. But this post so far focuses on stories that are mainly romantic. What about stories where romance is secondary? Same concept applies. You see this a lot in manga and anime. 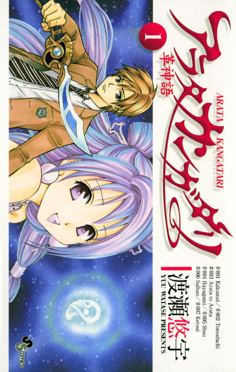 Take Arata the Legend by Yuu Watase (highly recommend, by the way), for example. The story revolves around a teenager named Arata who ends up in an alternate universe, where he becomes a messiah figure in the process. Arata ends up traveling around the universe with a band of magical warriors to gather magic items and save both worlds, while also dealing with his own fears and insecurities. These are the main outer and inner conflicts of the story. 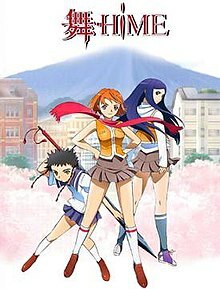 However, a sub-conflict in the story revolves around a love triangle between Arata and two girls who travel with him, a warrior girl and a healer. Both are attracted to Arata, Arata’s attracted to one of them, and because of various misunderstandings and past experiences, they’re unable to be honest with one another with their feelings, genuinely thinking that one might be better with the other or that one doesn’t like the other. This subplot is a major ongoing part of the story, and one of the reasons I always look forward to new volumes coming out (waiting on #25 since August last year). As you can see, a story with a romance but no challenge to that romance is more often than not less exciting than a romance with challenges to it. The exceptions, in my experience at least, would be stories where the romance is a minor element in comparison to other issues in the story (the anime Code Geass definitely comes to mind in that aspect. Also highly recommend that one), but if that’s the case, then the romance probably isn’t a big part of why you’re into this story, right? But when a story’s romance is a major aspect of why people would want to check the story out, having a conflict would definitely make it a more interesting aspect of the story. Otherwise, all you’ve got is an anime where you’re just watching and waiting for these two obviously-attracted-to-each-other people to take that first step and kiss each other and that’s about it. I’ve been nominated for the Starlight Blogger Award by my good friend Katja from Life & Other Disasters, aka The Impossible Girl Blog. She gets nominated for a lot of these things, and the fact that she willingly does so many of them astounds me every time (I’m not sure I’d have the patience if I got nominated for these all the time). 2. Answer the 3 original questions and then the 3 new questions from your nominator given to you. 3. Nominate your 6 favorite bloggers! In your nominees I would like for you to think at the light emanating from the stars the ones that truly touch your soul with their work, the ones that are the light for you a true STARLIGHT Blogger. 4. Please pass the award on to 6 or more other Bloggers of your choice and let them know that they have been nominated by you. 5. Include the logo of the award in a post or on your Blog, please never alter the logo, never change the 3 original questions answer that first then answer the 3 new questions from your nominator and never change the Award rules. 1. If you could meet anyone throughout history, who and why? Oh, that is a tough one, especially since I’m such a Whovian. I’d guess I’d like to meet a few spiritual or religious figures. Shri Mataji, the founder of Sahaja Yoga, as well as the Lubavitch Rebbe, who’s pretty big in Hasidism. I think I might also meet a few authors: Shakespeare, Agatha Christie. I don’t know, that would be fun. 2. What is your favorite book and why? Ooh, I hate this question. It’s always changing. I guess I’ll go back to my stock answer for the past year and a half, because I haven’t read anything to top it yet: Battle Royale by Koushun Takami. Great storytelling, powerfully dramatic scenes, lots of great social commentary, and characters that you can’t get out of your head. I love it, and I recommend it to anyone who was dissatisfied with Hunger Games and wanted something more. 3. Who is your favorite fiction character from any medium and why? Do I have to pick one?! Fine, I’ll pick one. I know most people expect me to say the Doctor, and while I do love him, I think it might be Lelouch Lamperouge from the anime Code Geass: Lelouch of the Rebellion. 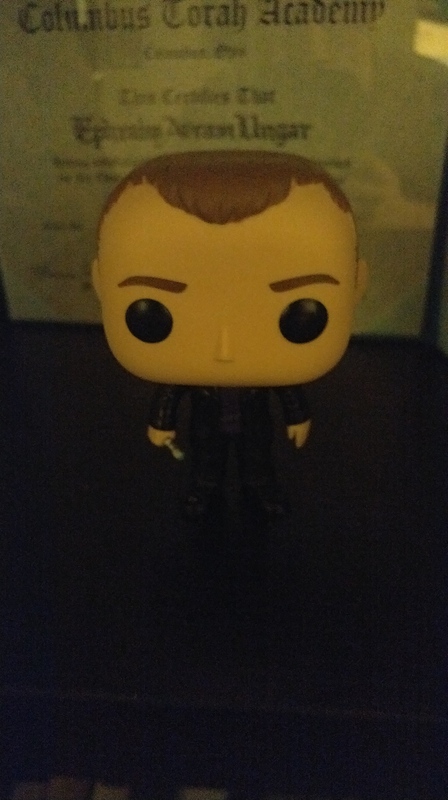 He’s such a fun character. On the one hand you hate what he’s doing in order to accomplish his goals, but at the same time you’re fascinated by him and you cheer him on because you see the good he’s doing and the wrongs he’s fighting. I guess that means he’s a good antihero, and the company behind the anime did their job. 1. If you could be a character in any fictional story of your choosing (book/TV/movie/comics/etc. ), where would you want to go? If I’m interpreting this question right, I could be myself, but I’d be an original character in an established universe. Well, that’s easy. I’m hanging out with the Doctor on the TARDIS, fighting off monsters and saving planets. Heck, I have a bunch of ideas for stories where the Doctor is teamed up with a young man–maybe based on myself–whom he takes in and becomes like a father figure to, all the while dark forces watch their progress together for their own sinister purposes. Steven Moffat, call me. We’ll make the most exciting series of DW ever…or a great series of novels. 2. What’s a song that always gets you in a good mood? Oh, there are so many, spanning a range of genres. I guess if I’m going to choose, I’d have to say “Voodoo Child” by Rogue Traders. I only listen to it when I’ve accomplished something, like finishing the latest draft of a story or getting published or something along those lines, so I associate it with good times and good things in my life. One of these days I’d like to do a flash mob to it and load it onto YouTube as a promotion for some book or another. 3. Did you ever consider going to a Comic Con? If yes/no, why? Would you dress up as someone else? Oh, I would love to go to a Comic Con. I would probably wear something that would promote one of my books and get people interested in reading them somehow. Like for Reborn City, I’d have the Hydra symbol on the back of a T-shirt and the front would say “ASK ME ABOUT THE BACK OF MY SHIRT.” It certainly would be a conversation starter. The problem is that besides getting the tickets, hotel and transportation costs, and everything else, it costs a little too much for me at this point in my life. But maybe someday when I have a bit saved up…anything’s possible. 1. When was the last time you saw a scary movie? What was it, what did you think, and do you normally watch scary movies? 2. What are you dressing up for this Halloween? What are your plans for the holiday? 3. What is something (book/TV show/comic book/movie) from your childhood that you still enjoy today? Okay, that’s all for now. Tomorrow I’ve got another post coming out, so look out for that. In the meantime, I hope you enjoyed this post, my Followers of Fear. I know I did. Gut nacht!